Last week, I took you to my long time home of East Toronto. This week, I'm introducing you to my new home, Peterborough & The Kawarthas -- a gateway to cottage country, the two go hand in hand. While I'm still a newbie in this small city, it didn't take long to discover its gems. They go way beyond butter tarts, lift locks and canoes; but those are great too. A quick 1.5 hours (or less) from Toronto, this little city boasts beautiful natural scenery and all the things you'd expect to find in an urban centre. Longtime locals, students (from Trent University) and expats mingle to create a casual vibe in this city that loves nature, art and good food. 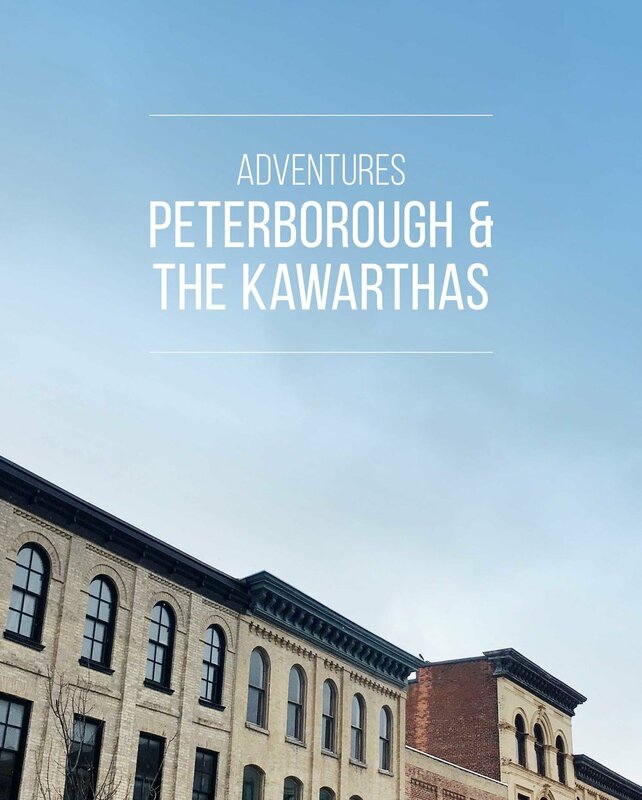 You'll find a bustling art scene with contemporary spaces, loads of live music, and theatre performances in Peterborough and The Kawarthas. Peterborough even has its own Symphony Orchestra. Summers are a dream in Peterborough. You can hop in canoe or kayak on the river (from downtown), visit quaint cottage country towns and lakes, and be back in time for a patio dinner on Hunter Street and a free concert under the stars -- all in one day. The towns of Lindsay, Lakefield, Bobcaygeon, Buckhorn and so many more offer their own unique charms and experiences throughout the lazy summer months. Evans Contemporary Art Gallery | Peterborough, Ontario. Peterborough may be a small city, but there is a BIG love for good food. There is a ton of local flavour in this city from farm to table food, to local wine and beer. It's all here from casual to posh. You can even enjoy a 6 course dinner IN the Peterborough lift locks during the summer. Here are a few of my favourite spots, but I'm still discovering new spots all the time. Specializing in comfort food and HUGE portions, Two Dishes is always lined up or full as soon as the doors open. The food really is delicious, just come prepared with a big appetite for things like fried chicken, pan bread, hearty breakfasts, lunches, sweets and so much more. As seen on the Food Network's "You Gotta Eat Here". A Belgian style pub in downtown Peterborough, this spot offers up a lengthy list of imported beer. My favourite is the Vedette -- a wheat beer that's almost always on tap. Try the moules frites (blue cheese) and the vegetarian pate. Both are tremendous, as are their bigger plates. Local brews are a plenty thanks to these two local spots. Both sell their craft beer at their retail spots in Peterborough. The Publican House is set to open a gastropub this summer (2017) and Smithavens often has Ellie's BBQ in-house. For a steal too. $11 gets you a pint of craft beer, a brisket sandwich and two southern sides. So good! Unpretentious, comforting and delicious is BE Catering. Yes, of course they cater events and weddings in the area; but they also have a small luncheonette in Peterborough at the corner of Charlotte and Park Streets. It'a around the corner from me, so you'll often find me grabbing a morning Americano or stopping in for one of their lunch specials. I anxiously wait for their take on Banh Mi every week. Self described as a place to find happening food, I'd have to agree this place to find yourself. A lovely French inspired coffee and tea shop will greet you just north of downtown on George Street. Lindsay, the owner, is wonderful at dreaming up new baked goods and beverages that will delight your taste buds all year round. The decor and ambiance will make you feel like you've landed in Paris. This hip espresso bar is a great place to work, meet locals and drink espresso, of course. I love the cortados and grab-and-go lunch offerings. It's right in the heart of downtown on Hunter Street with a small patio, but big heart. Weekend visits often include live and local music. A quaint, but delightful and chic spot -- Le Petit Bar is a wine bar and sister to St Veronus next door. The wine list is always changing and features local wines and wines from abroad. The charcuterie options are top shelf with choices of local cheese, meats, and smoked salmon paired perfectly with fruit, mustards and honey. Speaking of top shelf, I love watching the bartender use a ladder to fetch things from the ceiling high shelves. Come for Sparkling Thursdays where you can taste Prosecco cocktails for $6. Salud! Peterborough loves its farmer's markets and it shows in the culinary scene. There is a distinct respect for supporting local farmers. I love them too. Markets run every Wednesday throughout the summer, and Saturday all year-round (there are 2 on Saturday -- that's a whole other story). Shopping seasonally is made easy by these farmers. Hard Winter Bread Co. makes bagels right at that market that rival Montreal's. You have to get there early, but it's worth it. Don't forget smoked salmon and cream cheese. This quaint spot is not to be missed while in Bobcaygeon. Of course, there's always coffee brewing at the Kawartha Coffee Company; but stay for lunch, some sweets or even a beer. They pride themselves on offering local food with global flavour and occasionally, live music. Two Dishes Cookshop | Charlotte Street in Peterborough, Ontario. Art by Holly Young. Watson & Lou | Water Street in Peterborough, Ontario. This shop on Hunter Street is stocked with modern furniture, housewares and gifts. Megan, the owner, has impeccable taste and will help you find anything you need. She offers brand like Gus Modern and Drake General alongside local artists and craftsmen. Brand new to Peterborough, you'll find Watson & Lou on Water Street in the downtown core. It's a hub for local makers, art lovers, and the latest in hip handmade goods for the home. Owners Anna and Erin are proud to present the best of local goods with half of their stock coming from makers in the Nogojiwanong/Peterborough region. Watson & Lou also offers a creative work space for co-working and events/workshops. This casual shop is a fixture in Peterborough and part of the group that owns the freshly reimagined SOS (for the ladies) and newly opened Providence (for the dudes -- complete with an in-house barber and bar) Sneakers and street wear are in abundance at this shop on George Street, but my favourite items are the tees that represent local towns and neighbourhoods. From Havelock to Keene, and everywhere in between. Nothing claims love for this small city more than a PTBO tee or sweatshirt. 20 minutes north of Peterborough is the sweet little town of Lakefield. Here, you'll find the shop and full studio, Stony Lake. A posh, but causal shop that services locals and cottage folk alike. You'll find cozy home furnishings, rugs, decor items and gifts. The owner, Lisa, also specializes in interior design to help bring dream cottages (and homes) to life. Don't forget to say hello to the famous pup, Owen, while visiting. A little further west, you'll find Douglas + Son in the town of Bobcaygeon. Yes! The town from the Tragically Hip song. The owners left life in Toronto and moved to the country to open this idyllic shop. This shop offers up new goods and vintage finds for the home, but they also have tees and sweatshirts. Casual, but well styled goods. Also located in Bobcaygeon, is Gilstorf & Gray. A fine home and gift shop that specializes in cottage decor. It has an airy and timeless vibe where you'll find artisan goods from local and Canadian makers. It has a hygge feeling about it with so many soft textiles, and warm wood pieces. Peterborough and The Kawarthas are the perfect spots to experience Ontario at its best. Getting outside is just part of life here, and so is soaking in local culture and music. I love the big city; but if you're open to embracing the hygge life year-round (simplicity), you'll get a taste of the good life in Peterborough and The Kawarthas. Live music can be found in Peterborough all year round. Small venues give you a chance to see some of your favourite bands up close and personal and tickets are very reasonable, or free. No summer in Peterborough is complete without a night at Peterborough Music Fest. Free performances take place outdoors two nights a week all summer long. If that's not enough, the Peterborough Folk Festival takes place in August featuring some of the best Canadian music. And it's also free. 4th Line Theatre and Westben Theatre offer theatre and musical performances throughout the year. Located in quaint country spaces (barns), these theatres attract locals and cottagers to take in a piece of Canadian culture under the stars. There are countless ways to get outside in this area. Treat yourself to a "nature bath" and enjoy the natural beauty by foot, bike or canoe/boat. In the summer, avoid the crowds and head to Laveanne Lavender Fields near Port Hope to enjoy the lavender blooms. Visit local beaches in cottage country. Or, head to the Trent Hills to explore. Warkworth is adorable and deserves its own blog post. A few of my favourite spots to get outside in the summer are Petroglyphs Provincial Park, the Warsaw Caves and Trent University Wildlife Sanctuary. In the winter, you can snowshoe and ski (downhill or cross-country) near Peterborough. The Kawarthas offer a Nordic Centre and Devil's Elbow and Brimbacombe are a short drive away. There are just too many spots to mention in one post. I'll leave it for another day after exploring more in this beautiful area. Have I convinced you that Peterborough is the place to be yet? You have to get out here to see and feel it for yourself. Did I mention house prices are a steal?! Come by and visit, or be my neighbour. And, if I've missed some spots, I'd love to hear about them. I've only just begun exploring and would love to learn more. Thanks for reading and enjoy!